In the winter season Chopta is fill with full of Snow and you can see here an amazing view if snow capped himalayan peaks and its neighbors surroundings. Chopta is one of the wonderful places for tourists and travelers; you can take here a peaceful rest on your holidays because it is away from crowd and pollution with daily busy market. Chopta is always a best place for those who want to take a peaceful rest in the lap of Himalayas and nature. By Roads: - Chopta is well connected with roads transport from other cities. By Trains: - Nearest Railway station is Rishikesh. Distance from Chopta is approx 205 km. By Air: - Nearest Airport is Jolly Grant Dehradun. Distance from Chopta is approx 220 km. 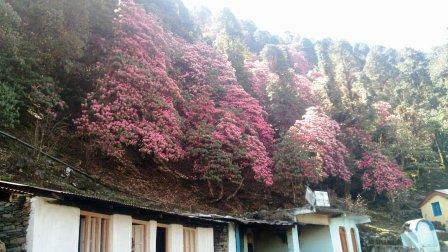 Best Time to Visit: - Best time to visit Chopta is May to July and Sept to Oct months. If you want to visit here to see snow then the best time is Jan to March month which is winter season. Weather: - Weather of Chopta is always glorious and cold; you can visit here in the summer season for spending you holidays. Where to stay: - You can take here all types of hotels and resort I means budget to luxury hotels and resorts.